Karcher is the world’s largest manufacturer of pressure washers with an extensive product line. The Karcher G2200 Gas Power Pressure Washer is part of their Performance Series pressure washers. 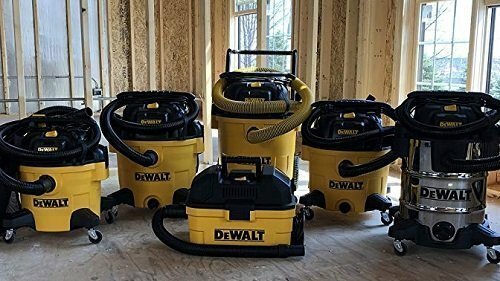 This model offers a lot of value if you are in the market to buy an entry-level pressure washer for small and large household chores. Since the G2200 is powered by gasoline and not electricity, you aren’t limited by distance. 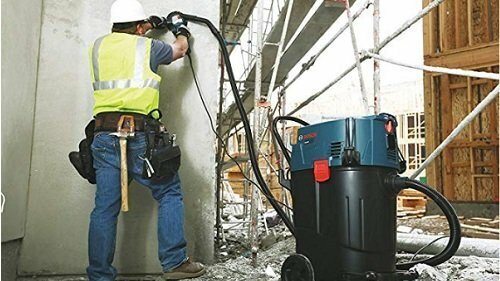 It has a 2,200 PSI and 2.0 GPM, and it’s powered by an acceptable-sized 159 cc engine, which puts the pressure washer’s capabilities at the high end of the light-duty range. Of course, you can’t talk about a pressure washer without discussing its pump. In this pressure washer, Karcher utilized an anti-corrosive axial cam piston pump with aluminum heads, which is small and self-priming. For jobs that call for detergent, the Karcher G2200 has a siphon-hose delivery system to be used along with a 65-degree nozzle. 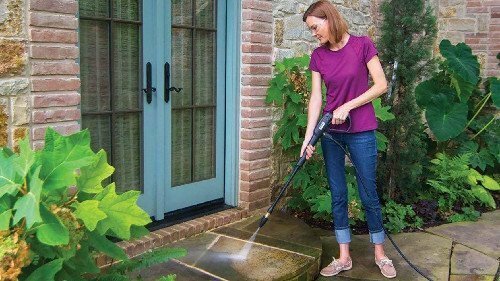 While this is not as convenient as an on-board tank system, the siphon hose isn’t much of a hassle when you consider that this pressure washer is designed for occasional household use. 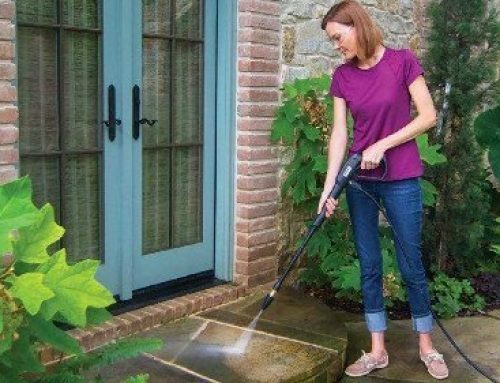 In regard to convenience, the pressure washer sits on tubeless tires, which are tough and don’t go flat, and its folding handle gives you more storage options. See full Karcher G2200 Review here. Karcher has a 65-plus year history of building and selling pressure washers. 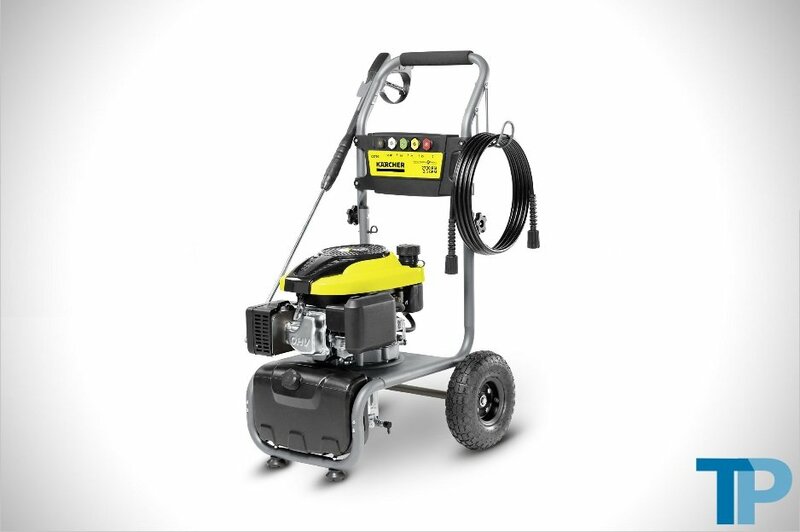 As the leading pressure washer manufacturer on a global scale, Karcher offers one dozen gas-powered pressure washers. 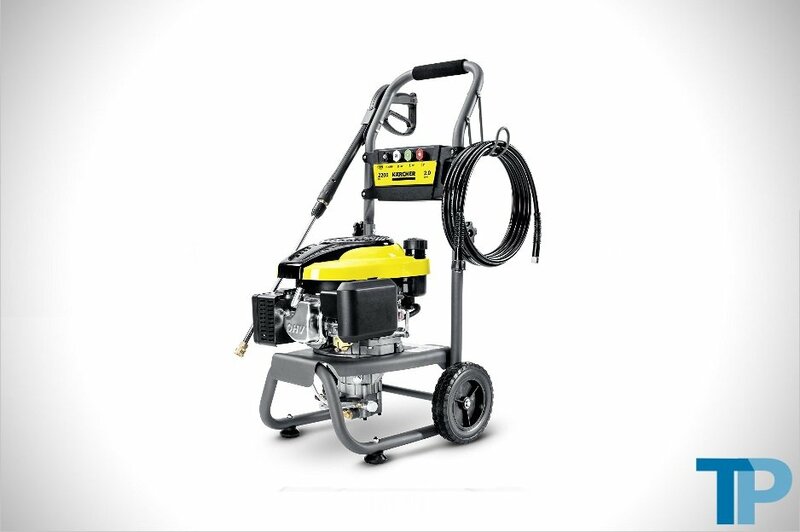 The Karcher G2700 Gas Power Pressure Washer is a robust pressure washer designed for frequent residential use. It’s equipped with a 25-foot high-pressure hose and 196 cc cylinder capacity, allowing it to put out 2.5 GPM of water at a maximum pressure of 2,700 PSI. With this kind of performance, the G2700 is suitable for medium-duty jobs and light commercial use. It also features an OHV that is less noisy, longer lasting and more fuel efficient than L-head engines. The pressure washer also has an axial cam pump with aluminum heads. While it isn’t as durable as a triplex plunger pump, the axial cam is definitely a step up from a wobble plate pump in terms of lifespan and efficiency. Since the pump has aluminum heads, you get more water pressure than you would with plastic ones. Another mark in the Karcher G2700’s favor is its detergent delivery system. Instead of a cumbersome siphon hose, the pressure washer has an onboard detergent tank. Plus, it comes with five spray nozzles and a locking mechanism on the spray wand. The handle even folds, so you can store it in small spaces, and its dual pneumatic wheels are made from high-grade rubber. See full Karcher G2700 Review here. Hands down, Karcher dominates the pressure washer market. 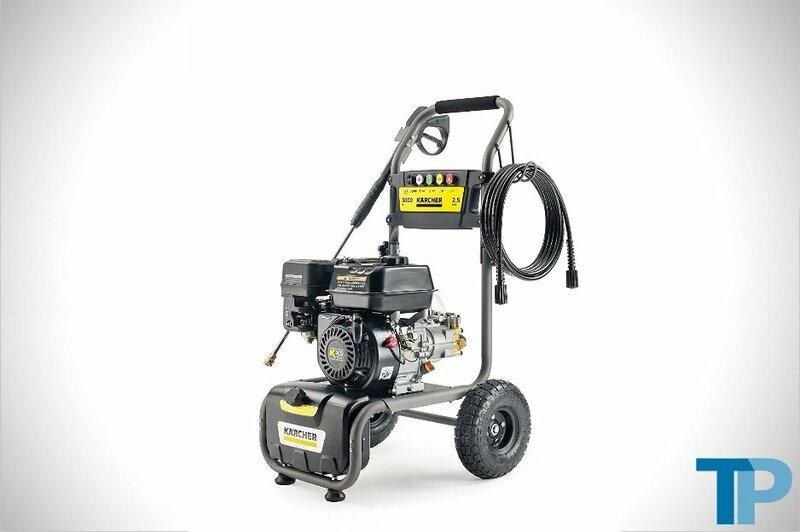 The Karcher G3000 Pressure Washer is a tough, sturdy gas-powered pressure washer that features a Karcher KXS 196 cc engine, which runs neck and neck with the power provided by big-name industrial engines like Honda. Since it is gas powered and doesn’t have an electric motor, you can use it without the hassle of wall outlets or extension cords. There is no inefficient wobble plate piston pump on this pressure washer. It has an axial cam pump with a head made from strong brass, not rust-prone aluminum or weak plastic. 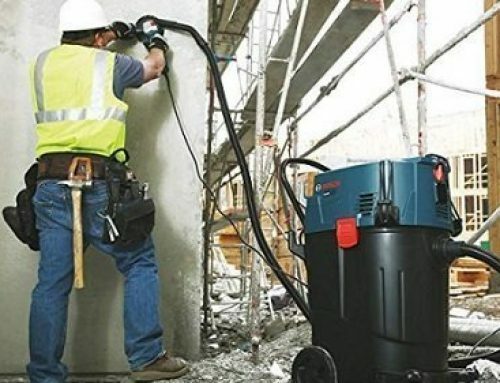 Between the engine and pump, all you get is a daily-use machine that offers high pressure and dynamic performance that can clean almost any structure. 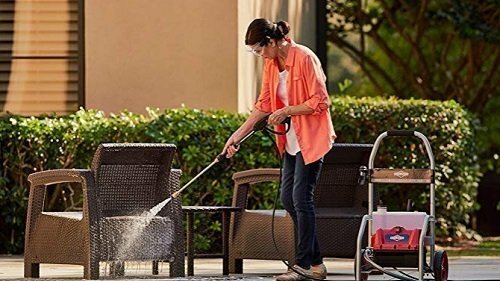 What concerns most consumers when it comes to pressure washers is the machine’s water pressure and volume. 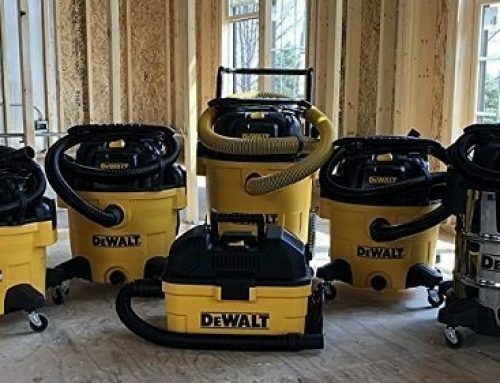 The 3,000 PSI and 2.5 GPM make this pressure washer a residential-commercial hybrid. With the G3000, you have all the nozzles you need to get the most from its impressive water output. From gentle to turbo cleaning, one of the five nozzles can offer the right level of water concentration for any task. These nozzles connect to a zinc-coated spray wand, so you’ll never have to worry about corrosion. 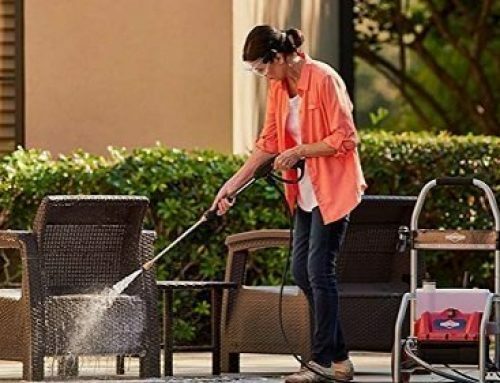 If you’re short on space, the backward-folding handle can accommodate your storage needs, and you won’t feel the pressure washer wobble and bounce thanks to its pneumatic wheels and steel frame. See full Karcher G3000 Review here.